There has been renewed interest recently in original Long Playing (LP) recordings. Moira has a small selection of three of her original LPs and for a limited time only, these are available for sale at �25 each. This special offer is only available direct from Moira Kerr. Send an email request direct to Moira at moira.maykerr@gmail.com stating which of the LP's shown below you wish to purchase and she will arrange for payment and for your LP to be sent to you - signed by Moira. The descriptions below are from the original album sleeves of the LP's. 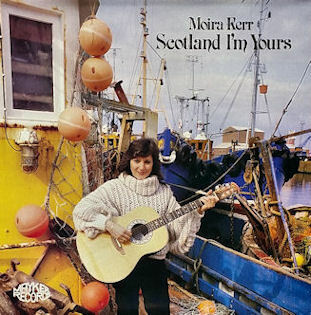 "Scotland I'm Yours" is Moira's third album on Mayker Records and possibly her best one to date. The main reason for this being that she had the good fortune to procure the services of the extremely talented Ian Lynn, who not only produced the album but played all the keyboards (and that's a lot of keyboards!) Ian is a regular member of the backing band of one of the finest talents to emerge from Scotland � Barbara Dickson. Moira met Ian at a concert of Barbara's and on that first meeting they talked about the possibility of doing an album together. It has appeared in the form of this interesting and varied selection of Scottish songs, all given a fresh approach by Ian, with arrangements which are very much in sympathy with the atmosphere and tradition of each song. The first track on side one, "The Island of Tiree", was written by Moira on the ferry returning to Oban from Tiree after being so impressed by the island and the friendliness of the people on her first visit there. A song which is always very popular in her performances is "Amazing Grace", sung to the words of the 23rd Psalm. It makes for a very beautiful song, of which Moira gives a warm and heartfelt rendering. That, coupled with Ian's piano accompaniment, may just leave you with a tiny lump in your throat. Scotland is handsomely endowed with traditional songs which relate to a particular incident or time in history. "Johnny Cope" is one such song which depicts the Battle of Prestonpans where Sir John Cope and his troops were routed by Bonnie Prince Charlie. This is a rich and lively arrangement guaranteed to set the toes tapping or even get you to your feet. The next track is also a foot-tapper despite the fact that it is a song about love. The lively and popular "Singing Bird", widely sung in Scottish folk clubs, probably originated in Ireland. The tempo slows again to finish with the lovely song, "My Ain Folk", which was written about the turn of the century. Moira sings it with such warmth and sincerity. Add to that, the sensitive arrangement and playing of Ian and you have a version which has already been hailed as one of the best ever. The second side starts with a rather spectacular and imaginative rendering of "The Mingulay Boat Song". Any listener who can't picture a sailing ship on a rolling sea, doesn't have any imagination! This is followed by "The Water Is Wide", an old traditional folk song still enjoying great popularity and which suits Moira's voice to perfection. The third track on side two is another new song recently penned by Moira herself - "Scotland I'm Yours For Evermore". Judging by the reaction to the demo tapes, this is proving to be a very 'catchy' little song and should receive lots of "air" play on the various Scottish radio stations. Next is the well known and loved "Wild Mountain Thyme", or as some people prefer to call it, "Will Ye Go Lassie Go?" A particular favourite of Ian's, he expressed a wish that it should go on the album and although Moira had already recorded it, she decided that it was well worth another rendering. I'm sure that now she feels the right decision was taken and Ian's arrangement for piano and harp gives it a graceful and ethnic quality. Side two finishes as it started, with a sea-faring song. "Farewell To Tarwathie", which is hauntingly beautiful but has never really been over-exposed, despite its longevity. This is portrayed by Ian who again has succeeded in producing a new and exciting sound. I hope you find it as stirring as I do. In fact the whole album is a sheer delight. Our special thanks to Colin Tod who took a series of wonderful photographs at the harbour at Ayr and also to Alan McCreath on whose fishing boat "Ocean Gem" the cover photograph was taken. 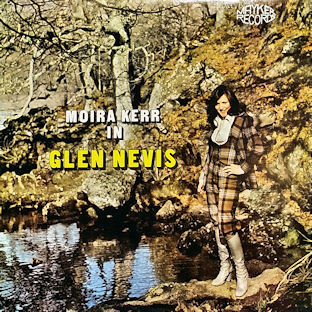 On this album, Moira Kerr displays the elegant and subtle voice which has won her acclaim throughout the country. In the past year she has established herself as a regular TV performer in Scotland, and the warmth of her singing has reached out to a wider audience, It's not Moira's style to introduce herself with a fanfare. The songs on this LP are designed for relaxation. There's more than a whiff of outdoor air. Listen and enjoy. How many times have people written in praise of Scotland? Its countryside has been described as rugged, wild, breathtakingly beautiful, fabulously fertile, a venerable vastness of luxuriant vegetation with magnificent mountains, perfectly peaked and sinuously streaked with silver streams. A poet's paradise, an historian's haven, an artist's awakening, a climber's calling, a dreamer's dream, a singer's song, a publican's shangri-la, and a tee-totaler's dead loss!! Scotland has many attributes but most of all, like the people, it has genuineness. There are five, or should I say four and a half of my own compositions on this album - one of them "Wee Laddie" is a joint effort. The lovely melody was written by none other than Jim McLeod with whom I have worked on many occasions and Jim asked me to write a lyric, which I did. Jim has also recorded this popular little song. "Scotland Again": This is another song which has been recorded by both Jim and myself, but as this is an all Scottish album and also as "Scotland Again" is always popular with live audiences, I decided it was worth doing again. "Scotland I Miss You Tonight" was written very recently, so recently in fact that it was just finished a few days before the recording date. So it almost didn't make it, but I'm glad that it did, as I think it's one of the nicest songs I have ever written. "The Crofters Ceilidh": While choosing and preparing the songs for the album, I came to the conclusion that there were plenty of ballads and only a few up-tempo tracks So I thought that I would write one incorporating a little humour, and this song was the result. It turned out to be a lively, catchy little tune which sets people's feet tapping and even puts a smile on their faces which can't be bad! "Glen Nevis" is a particularly favourite place of mine which I always visit several times each year. I never drive through Fort William without taking a run along the Glen Nevis road, and although it sounds a bit old hat and clichéd, it really never fails to uplift, invigorate, and give me that "glad to be alive" feeling. That's the best way I know of expressing it, but perhaps the words of the song convey it a little better. All the songs on the album are Scottish or about Scotland, with one exception - "Whiskey In The Jar" -which is Irish. Its lively arrangement was given fuel by the band's fiddler, but unfortunately the name of this well known and much appreciated band cannot be published because of contractual rights. However, I will give credit to Jerry Hamerf (acoustic guitar and banjo) who has featured on my last three albums. Jerry plays guitar with such feeling and sensitivity that it never fails to bring a lump to my throat, especially on tracks like "Wild Mountain Thyme". I think you'll hear what I mean, and I sincerely hope that you will enjoy my selection of songs. I would like to give my sincere thanks to Chris Worrall who produced the album and to Colin Nicholson who engineered it. The lovely cover photograph was taken by Ian K. Taylor. My final thank you goes to Frederick Mayer, my partner in Mayker Records, and of course, to you. 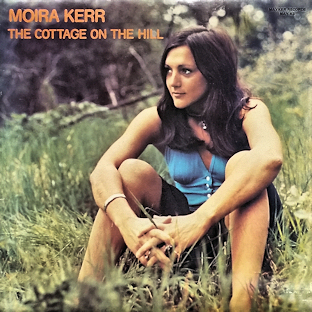 If you wish to purchase any of these vinyl LP's (�25 each for "Scotland I'm Yours" and "Glen Nevis" and �50 for "Cottage on the Hill"), send an email request direct to Moira at moira.maykerr@gmail.com stating which of the LP's you wish to purchase and she will arrange for payment and for your LP to be sent to you - signed by Moira.